In Walking with Trees, Glennie Kindred takes us on an intimate and profoundly connecting walk with thirteen of our native trees. She leads us into their world and opens our hearts to their wonders, their perfection and their interconnectivity. This is a book about relationships and inter-relationships: our relationship with the trees, their relationships with each other and with the natural world around them, and the flow of our communal relationship, past and present, which affects us all as interconnected life on Earth. Illustrated with the author’s exquisite pencil drawings, Glennie’s passion for trees is infectious, and she inspires us to look more closely, listen more intently and walk with trees more often. She shares her stories and encounters with trees and weaves together many ways to deepen our engagement with them: by growing them, harvesting and using them for medicine and food, through intuitive craftwork and meeting with them as part of our seasonal celebrations with Nature. She also encourages us to find our way into a more subtle relationship with the trees, as part of our journey to heal our fractured relationship with the Earth. Walking with Trees is a heart-response to our present times, reminding us of our power to co-create beneficial change, and to help restore ecosystems with the help of the trees. This is a book of our time, as we come to recognise our deep interconnectivity with the natural world around us. "Walking with Trees is a rich compendium of arboreal wisdom, ancient and modern, spiritual and practical from a wise and compassionate teacher of Earth wisdom. Glennie Kindred’s gentle, power-full words and images move us deeper into ourselves and deeper into the world, to the place of no separation. This is where we need to be at this time.
" - Lucy H. Pearce, Womancraft author of Medicine Woman; Burning Woman; Full Circle Health and Moon Time. "I love this book. Walking with Trees is a portal into the world of some of nature’s most sublime sentinels. Dip in and be bathed by trees and their wisdom. "Glennie has real authority in this subject. She has earned it over years of working with deep integrity, a profound heart based intelligence by quietly, safely guiding thousands of people in how they can make very real connections with the intelligences of Nature and the vitality of the cycles. She nudges us to weave ourselves back into our birthright and true selves and is greatly revered in the consistency of her accuracy. 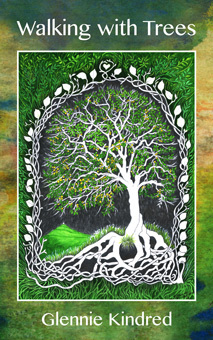 ''Glennie Kindred ndred has always been such an abundant and finely-honed wordsmith, reaching into the alchemical infusion of nature, seasons, sacred land and ancient craft to beautifully envision their interface with our human lives and understanding. Glennie's knowledge is profound, her sharing is always generous, and her vision for environmental integrity is an urgent and essential call for a more fiercely protective guardianship of our planet, and the trees on which our existence, health and spiritual well-being depend. ''I've always found Glennie’s work to be both authentic and inspirational, and her latest book 'Walking with Trees' is no exception. Within it, she generously shares a lifetime's insights, providing the reader with many practical suggestions to connect with, and learn from, our native trees. With plenty of Glennie’s delightful drawings, this really is a book I can wholeheartedly recommend. I love this book, which is imbued with Glennie's deep love of trees, and illustrated with her own beautiful & magical drawings. I really like the practical recipes and information, as well as the exercises for connecting with trees and appreciating them as fellow sentient beings who share this earth with us. Highly recommended! "Glennie’s book reminded me of our deep, timeless connection. Through her sharing I felt the deep connection of our ancestors continuing through these beautiful beings (the trees) and that my steps and how I work with the trees will impact and add to this continued timeless human connection. The book left me with feelings of deep reverence but also equally empowered within this co-creative relationship we all have with the trees. I feel grounded, realistic and positive about my continued efforts as an ‘earth warrior’ and inspired to keep taking small steps. "This is no ordinary tree guide, Walking With Trees is paradigm shifting, stretching our relationship with trees in many directions. There is a fascinating depth and scope of information and insights shared. It is personal and global, factual and spiritual, intuitive and ecological, practical and mysterious. Reading this I have the desire to reach the levels of connection that Glennie has, and the commitment to take the time to walk the landscape with new vision, and follow the clear guidelines given. Walking With Trees invites us to step outside of our usual ways of thinking and into the immense world of trees. It is a call for us to go deeper, expand our consciousness, awareness and eco-literacy, to let go of conditioning, to think and act like ecological beings ourselves. We are given ways to use their tremendous wisdom for how we approach our own lives and our care for Earth.